On our popular Pisa and Florence Shore Excursion from the cruise port of Livorno, you will have the opportunity to travel into the heart of Tuscany and visit these top destinations: Pisa to admire the famous “leaning tower of Pisa” and Florence, the birthplace of Renaissance. Your Stefano Rome Tours professional Driver will meet you holding a sign with your name on the pier next to your ship at 8:00 AM, and bring you back at 5:00 PM. Due to greater distance and port fees, tours starting from La Spezia Port are 100 EUROS MORE than tours starting from Livorno. Your journey through Tuscany begins with your first top in Pisa, one of the most iconic cities in Italy famous for its “leaning tower of Pisa”. You will visit the impressive Piazza dei Miracoli (the Square of Miracles) that displays most significant architectural monuments, witness to Pisa’s historic wealth and power. You will have time free time to admire the iconic “Leaning Tower”, the beautiful Cathedral, and the Baptistery. The stunning square with breathtaking architecture is not only recognized as one of the leading centers for medieval art, but it also earned the prestigious title a UNESCO Heritage Site. 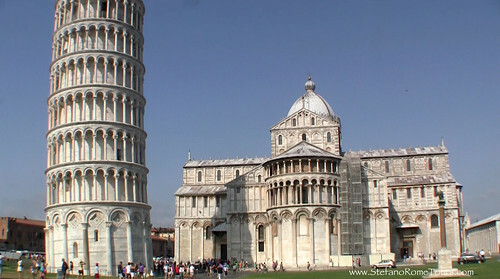 Here you will see many people standing “just so” with their arm extended in front of them to prop up the leaning tower. Have fun being creative with YOUR great photos in front of the tower! 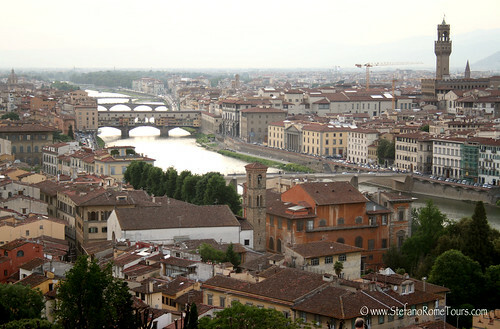 Your tour continues through Tuscany’s characteristic landscape to the Renaissance city of Florence. 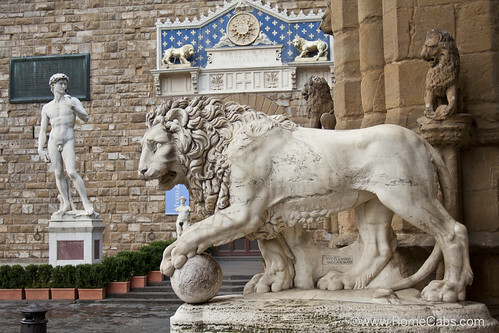 Italy’s cradle of Renaissance is also Tuscany’s treasure chest of the world’s most priceless and famous works of art. The historical, artistic, cultural and scientific impact of Florence on the world around it is overwhelming, and its heritage unparalleled. 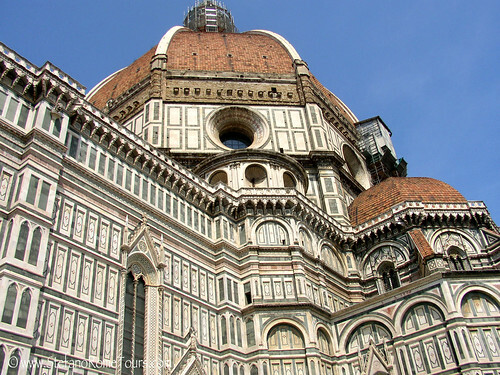 You will have the opportunity to see and visit some of Florence’s splendid squares, museums and churches. A short drive into the historic center will take you to the Basilica of Santa Croce, famous for the impressive funerary monuments of some of Florence’s most illustrious historical figures: Michelangelo, Galileo Galilei, Lorenzo Ghiberti and Niccolo Machiavelli. Stunningly beautiful works of art that decorate the basilica were created by great masters such as Giotto, Cimabue, Donatello, and Giorgio Vasari among many others. Piazza del Duomo is where you will have the opportunity to admire Florence’s impressive the trio that are part of the UNESCO World Heritage Site: Cathedral (Basilica of Saint Mary of the Flower), Giotto’s Bell Tower, and the Baptistry - whose exteriors are decorated with polychrome horizontal strips of stunning green, white and pink marble. The cathedral (also known as the Duomo) is one of Italy’s largest churches, and before modern age, its immense dome was the largest in the world...as you see it today it’s still the largest brick dome to have ever been constructed. 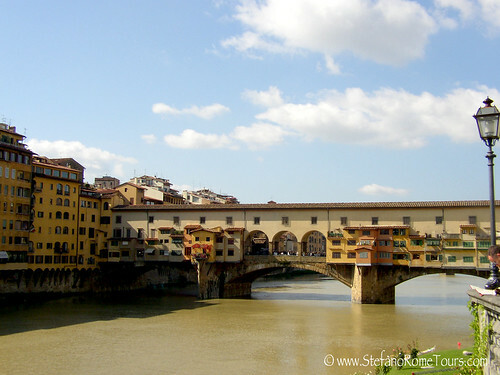 One of the iconic images of Florence is the Old Bridge: Ponte Vecchio. With charming gold shops resembling jewelry boxes, breathtaking views of the Arno River flanked by aged ochre and sienna buildings, Ponte Vecchio is quite a picturesque setting to behold. Next to Uffizi museum is Piazza della Signoria that features Palazzo Vecchio and and a collection of incredible pieces of Renaissance statues in the square and the open-air sculpture gallery inside the arched Loggia dei Lanzi. You can enjoy a Tuscan lunch at one of the many different restaurants in the piazza so you can enjoy the beautiful scenery that surrounds you. A visit to the renown Accademia Gallery to see the original David by Michelangelo, as well as other notable Renaissance masterpieces and paintings is not to be missed. For important information on Accademia Gallery admission tickets, please read the Please Note section below. From here you will join your Driver for a relaxing drive back to your cruise ship. Thank you for choosing Stefano Rome tours for your tours and shore excursions in Italy. We look forward to meet you and to show you our beautiful Italy! * IMPORTANT: ALWAYS CHECK YOUR SPAM FOLDER. If you submit a reservation or email and have not heard from us within 24-48 hours please check your spam folder, especially if using hotmail and msn accounts. * The Tour Price for “Pisa and Florence Shore Excursion” includes your own personal English speaking Driver and a private deluxe vehicle, Italy VAT tax, fuel, insurance, and all applicable toll and parking fees. * The Tour Price for “Pisa and Florence Shore Excursion” does not include entrance fees to museums or churches, lunch, gratuities, licensed tour guides hired separately, or any other personal guest expenses. * The Total Price for the tour is per vehicle not per person. Guests may share the cost of the tour. Due to greater distance and port fees, tours starting from La Spezia Port are 100 EUROS MORE than listed price for tours starting from Livorno. * Please be aware that Accademia Gallery and Uffizi Gallery are closed on Mondays, and on national holidays: January 1, May 1 and December 25. It is also NOT possible to visit Museums on 1st Sunday of the Month as these are "free museum days" with no advance tickets available and long wait lines to enter. On these dates your museum visit will be substituted with other sites in Florence that best suit your interests and desires. * Please book either Accademia Gallery or Uffizi Gallery admission tickets in advance for the 11:30 AM time slot. Not reserving your museum visit in advance may result in lengthy wait in line or inability to visit. *It is NOT possible to visit both museums in 1 day. Accademia Gallery takes about 1 hour to visit. Uffizi Gallery takes about 2 hours to visit. Most of our clients book the Accademia Gallery to enjoy more sites in Florence. Italian laws aimed at protecting the integrity of licensed tour guides dictate that Tour Drivers cannot accompany or tour guests inside churches, museums, monuments or squares. Your driver will be obligated to remain with the vehicle while you sight see. * If you prefer to have a licensed local tour guide accompany you during your tour, we can make arrangements for you upon request as a courtesy service to our clients. Tour Guides are paid separately at the end of the tour service in Euro currency as they don’t work for us. Please inquire for a quote to book a private tour guide. Save significantly on this Shore Excursion by sharing your tour with other cruisers for up to 8 guests per vehicle. It is easy to do: just place an ad on Cruise Critic’s roll call with a link to this tour and invite others to join you. * Payment for the tour will be made in Euro funds at the end of your journey directly to your Driver. You may also pre-pay in advance using PayPal. Please let us know if you wish to prepay for your tour via PayPal. Please don’t worry, we do not require your credit card information, advance payments to reserve your tours, or punish you with fees for cancellations. We operate on the traditional Honor System, so we simply ask that any cancellations be made at minimum 7 days in advance so we can rebook your service and your reserved driver does not lose work for that day. Cancellations must be made by email and confirmed by us so we have it on record. We do not accept cancellations by telephone, text message, or 3rd party. We greatly appreciate your cooperation and consideration. * Please observe the modesty dress code when entering churches in Italy by covering your shoulders and knees as it’s possible to be denied entrance otherwise.